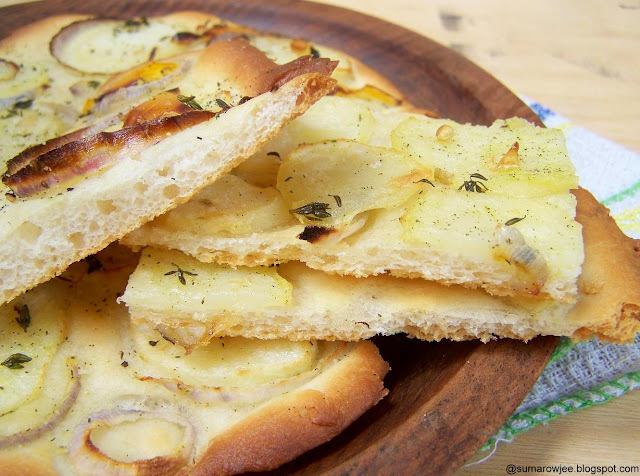 Cakes & More: No Knead, Easy & Quick Pizza - It Can't Get Easier! 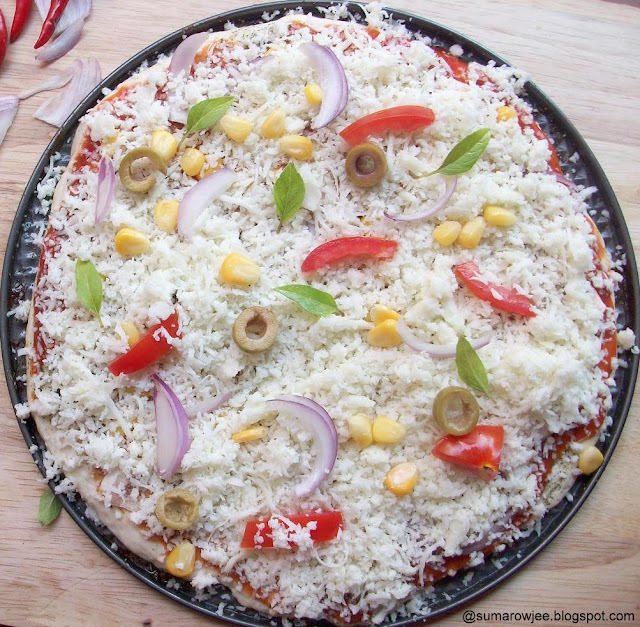 No Knead, Easy & Quick Pizza - It Can't Get Easier! Its no secret that I love Peter Reinhart's Napoletana Pizza Crust, but I still keep looking out for and trying out new recipes. 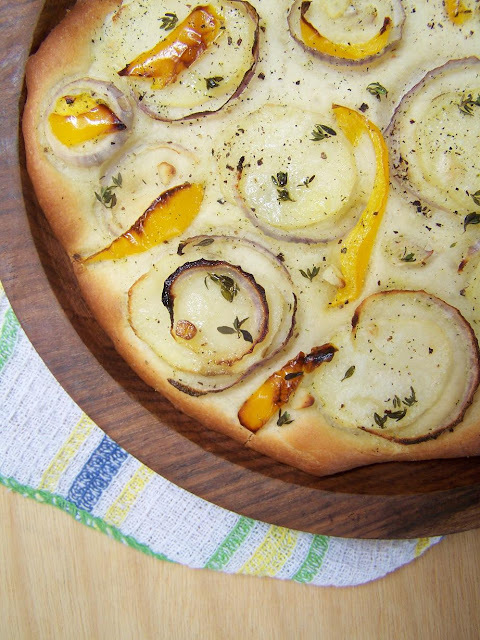 A good dependable recipe and a good pizza for all the times you need one. Peter Reinhart's recipe when you have the luxury of planning well ahead, flexibility to make pizza anytime over the next 3 days. How about one when you need pizza in a real hurry without any prior planning? Ever since I have discovered how easy it is to make pizza from scratch at home, ordering pizza in is something I can't digest. Good money spent on not-so-good stuff. If I had my way and some cheese at home, I will have good pizza ready in, say, an hour and a half, sauce, dough and all? My kids wanted to order pizza one day and yours truly all but kicked my legs and cried, imploring not to do so. The trade off - my 11-year-old budding foodie would get to make the dough. The young food enthusiast these days has been contemplating gastronomy as one of his future choice of academic options! Food love, one trait he has inherited from me! The deal I suppose was good enough for him to be content with eating dal-roti-subzi for the moment. The next day saw us all set to make pizza, the sauce ready to go on it, the elusive cheese reassuringly sitting in the fridge. A pizza from this no-knead flatbread was the plan. Sure made my son happy as he made it successfully! Tough for a kid or a beginner to fail when the dough is as simple as gathering all ingredients in a bowl and beating 20 strokes with a wooden spoon. The sticky dough goes directly on your pizza pan, prepare the toppings while it rises .The sauce can preferably be made before you make the dough as it also needs to cool. Rest the dough for 30-40 minutes and bake. No fuss, no knead, quick and easy! The reliability of old tried and tested recipes always tempt me to play around, this time the playing around restricted to simply dividing the dough into 3 parts and baking it with sauce and toppings in a very hot oven. Really simple but also works really well! I tried this with a potato, onion, garlic and EVOO topping too which was OK-ish, but the classic tomato sauce and cheese will always be a favorite! 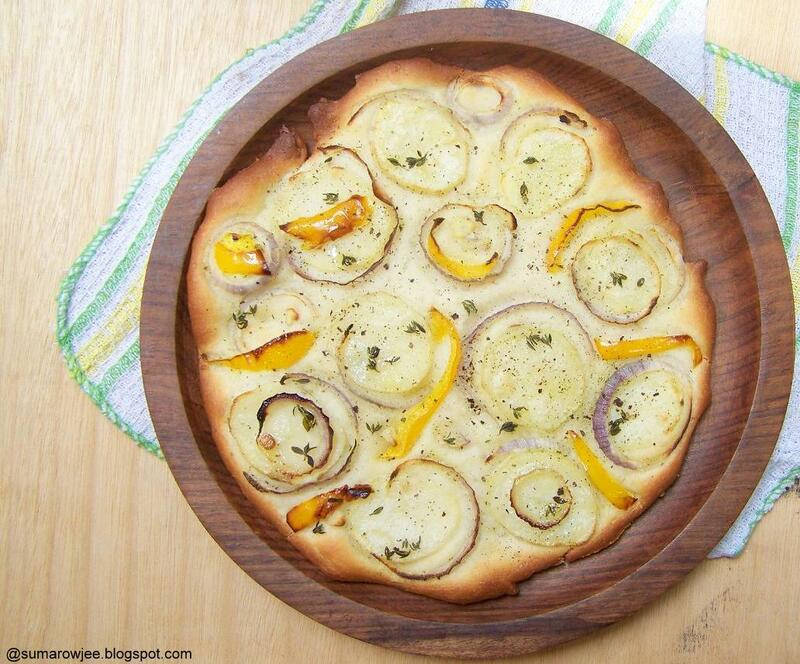 The recipe below makes 3 8-9'' pizzas, depending on the thickness of the crust. Procedure : Generously grease 3 9'' round or square pans or two large sheet pans with extra virgin olive oil. Enough oil (say about a teaspoon per pan ) will give your pizza a golden and crisp crust, easy release too. Keep aside. Sift together the flour, salt and garlic powder. Keep aside. Take the water, oil and yeast in a medium sized bowl, tip in the flour mixture. (If using active dried yeast, mix it with lukewarm water, 1/2 teaspoon sugar, allow to stand till frothy, 5-10 minutes, add the oil and the rest of the ingredients) With a wooden spoon, stir to bring it all together, then beat 20 strokes. The dough will be sticky. Divide it into three equal portions, you must eyeball correctly or weigh for uniformity in baking time and thickness of the crust of each pizza. Dump each portion on one pan. With greased hands, push the dough on the pan to make a 9'' round (about 5 mm aprox). (or smaller ones for a thicker pizza. I like mine with a thin crust). Try to keep the thickness uniform throughout (one of mine got a bit thicker in the middle). Keep in a warm place (cover if possible, taking care that the lid does not touch the crust or the area immediately around it) for about 25-30 minutes (may be 40-45 minutes when its not hot) or till the dough is puffy, not necessarily double. Pre-heat the oven to 250 degrees C (or higher if you can set in your oven) in the meantime. Spread the sauce and the vegetables on it and bake for 13-15 minutes (couple of minutes longer for a thicker crust) or till golden brown around the edges (watch carefully towards the end as you don't want it to burn or turn into a cracker) Remove from the oven carefully, top with more sauce and cheese, bake another 2 minutes till or the cheese melts. Remove, allow the cheese to set for a minute, slice and serve immediately. Not a bad crust for a super easy, tasty and quick pizza, what do you think? Way better than the one you will get in 30 minutes! So next time you need pizza on a whim, you may not really want to reach out for the phone...head to the kitchen instead! Wow! Looks promising! Yes, no number of pizza recipes is enough! If its dry yeast what do we do? Oh the pizza looks amazing and very crusty and thin. I love home made pizzas too! Oh wow Suma ! Love the look of that crust and yes, home made pizza is really the best...and hey, when are we meeting ? Thank you so much for this recipe. Turned out wonderfully. Cocoa Tuiles - Tuiles Love!